Carousel Windows Ilkley operate from a 4,000 square foot factory and office complex, providing made to measure double glazed windows for families across Ilkley. We're a family run business ourselves, and we understand the importance of security for your family. That's why we've been very busy making sure that all the latest security functions are available on the windows we supply our customers. 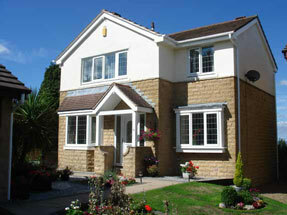 So not only are our uPVC double glazed windows incredibly efficient, they're also highly secure. Carousel Windows is a family run business and has been providing double glazed windows in Ilkley since we started our business. Ask around and speak to some of our clients - we supply and install the very best uPVC windows and can guarantee that you'll enjoy the same professional and courteous treatment that all of Carousel Windows Double Glazed Windows Ilkley customers have enjoyed since 1991. We're now offering our customers all the desirable, traditional features of an authentic sash window, but with all the additional benefits and conveniences of modern PVC-U. Our windows are well- balanced, so they won't stick, jam or slip. And cleaning them couldn't be easier. The built-in tilt feature means that you can clean both sides of the window from inside the house. While you are probably familiar with the benefits that PVC-U brings to the replacement window industry (like warmth, draught and sound proofing, not to mention longer lasting performance), you'll soon see that our double glazed windows stand out from the rest. We ensure that all of our windows carry the 'A' energy rating. The 'A' rating is an industry standard which states that the double glazing is the highest energy specification. This is all the more important in today's climate of colder winters and rising fuel bills! If energy rating and looks are first and second on your list, then our protective weather-seal must come a close third! The weather seal ensures that no matter how bad the weather gets in Ilkley, the heat welded corners on our double glazed windows will prevent the rainwater from entering your home. We put a special integral drainage channel in the frames in order to keep you dry and warm, and to keep the weather on the outside! The weather isn't the only thing our windows keep out - the intricate internal structure of the window frames mean that they allow less heat to escape than regular windows, and they also reduce the intrusion of outside noise. As well as this, all casement windows are reinforced with galvanised steel when structural strength is needed. In fact, our double glazed windows Ilkley customers enjoy the highest standard of security in our factory manufactured windows. Because we glaze the windows internally, the risk of burglars trying to remove the glass and gain access to your property is hugely reduced. Not only that, but all of our frames are made from 70mm uPVC making them extremely resistant to impact.